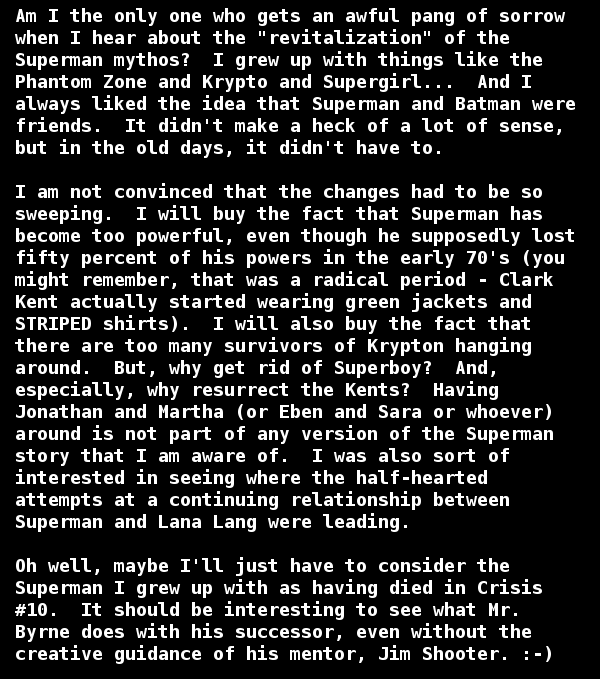 Over the past couple of entries, we dove in on SM’s discussion piece wherein he opines on the no-longer-rumor of John Byrne coming in to revitalize the Man of Steel for the complex 1980’s DC Comics fan. Today we will check in with some of the conversation his post encouraged. As we discussed in the last entry, CF would not have to wait all that long to once more experience stories about the Phantom Zone and... "Supergirl". During the three-part Supergirl Saga starting in Superman v2 #21 (September, 1988), Byrne would sorta-kinda reintroduce both concepts. He would sadly have to wait quite a while for the reappearance of the one-true Krypto who would not show his snout until the Return to Krypton storyline that occurred in the year 2000. DC would try to hold the Krypto-faithful over by including him as part of the Time Trapper’s pocket universe, and also as something of an Easter Egg several years later. Superman’s fav’rit fan, Bibbo Bibbowski, found a stray dog and hoped to name him Krypton after the home planet of his fav’rit sooperhero, but the fella he got to engrave the pup’s nametag only chiseled in the first six letters. Eben and Sarah? What in the world? Okay. As it turns out, who we know as Jonathan and Martha Kent went through some naming-pains throughout their history. Originally they went by the names Sam and Molly, however, in 1942, a man by the name of George Lowther wrote a novel called The Adventures of Superman. In this novel, he named Superman’s adoptive parents Eben and Sarah Kent. 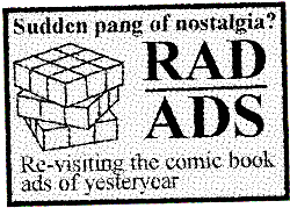 These names would carry over to the Adventures of Superman 1950’s television series as well. The names we are familiar with were introduced in the pages of Superboy stories in the early 1950’s. Their passing was covered in Superman #161 (May, 1963). As it turns out, shortly following Clark’s high school graduation, his adoptive parents take a trip to the Caribbean where they both contract a fatal tropical disease and pass in short order. Not the way you’d expect them to go... but, here we are. Power Girl is a toughie. Before the Crisis, Power Girl (Kara Zor-L) was Superman’s Kryptonian cousin. Sounds fairly reasonable. She shares a nearly identical origin to the Man of Steel, however, the rocket her parents loaded her into during the Fall of Krypton took much longer to arrive on Earth(2). Still, perfectly reasonable. She would go on to join up with the Justice Society of America, and becomes a full-fledged member when the Earth-2 Superman steps down. Post-Crisis (and post-Man of Steel) the word came down that Superman was the sole survivor, the true last-son, of Krypton. Rather than shuffle Power Girl off to comic book limbo, DC Comics decided to tweak her character. The post-Crisis Power Girl believed herself to be the cousin of Superman, however, she was in fact now of Atlantean descent. She is told that she is related to the wizard Arion, of all people… further, in Secret Origins #11 (1987), she learns that she has been in suspended animation for thousands of years before waking out of it. A couple of decades later due to the Infinite Crisis storyline, Kara’s Kryptonian heritage is finally reinstated. She reconnects with the Superman and Lois Lane of Earth-2, and plays a rather sizable role in the universe/continuity-shattering event. That’s all we have room for this time, I try to keep these a reasonable (read: not overwhelming) length. Next time we will continue with discussion prompted by SM's initial post, including some umbrage taken with John Byrne's mention of the Bible. As I mentioned in our last couple of pieces... I know some corners of the interwebs have amazingly knowledgeable and passionate Superman fans, so if you have any additions or corrections, please feel free to contact me in care of this website. Thank you for reading. 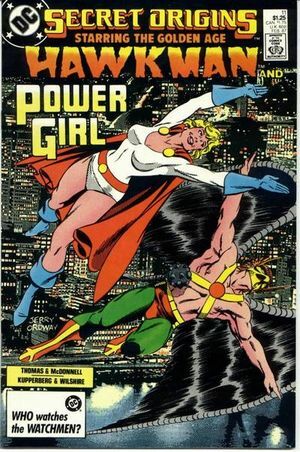 The idea of an Atlantean Power Girl doesn't sit well with me now, can't imagine how it must have gone over in the 80s. 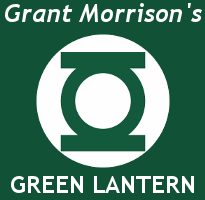 Glad they fixed that up in Infinite Crisis. Thanks for taking the time to comment. I think the decision didn't sit all that well with DC either, as it doesn't get a whole lot of play during the Crisis-to-Crisis era. In fact, they continued to play up some sort of (familial?) relationship with Superman the whole way through. Whether that was due to creators not being aware of the change, or simply disavowing it... I cannot say. And of course so much of Byrne's take was undone years later that I don't even know anymore if Jor-El is still sporting that headband or not. Welp, like they say, the only permanent thing in comics is Bucky's deat... uh, I mean the Flash's dea... uh, a little help? Have no fear, true believer... It appears that the headband made it through the perils of Flashpoint, and into the New-52. Some things ARE sacred!